Kindles and eReaders are fabulous for reading linear books. In fiction, stories and biographies you start at the beginning and read through to the end. Perfect for eReaders. I take my Kindle with me everywhere for this. My new book How to Write a Saleable Book in 10 Minute Bursts of Madness is a perfect example of why a “How-to” or “Self-help” book is best read in physical form. The problem for many would-be writers is that they never get started on their book. Or if they do get started, they never finish—or they slow down in the middle, procrastinate and lose interest. 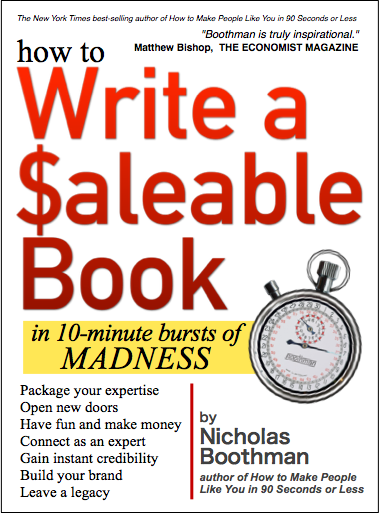 How to Write a Saleable Book in 10 Minute Bursts of Madness is aimed at non-writers who want to package their expertise, connect as an expert, build their brand and leave a legacy. It is a very hands-on book with a unique, tested approach that requires writing right there on the page, so that in a matter of minutes the entire framework for a book appears before them. This is just not practical or possible with an eReader.